May. 3, 2016 8:00 p.m. 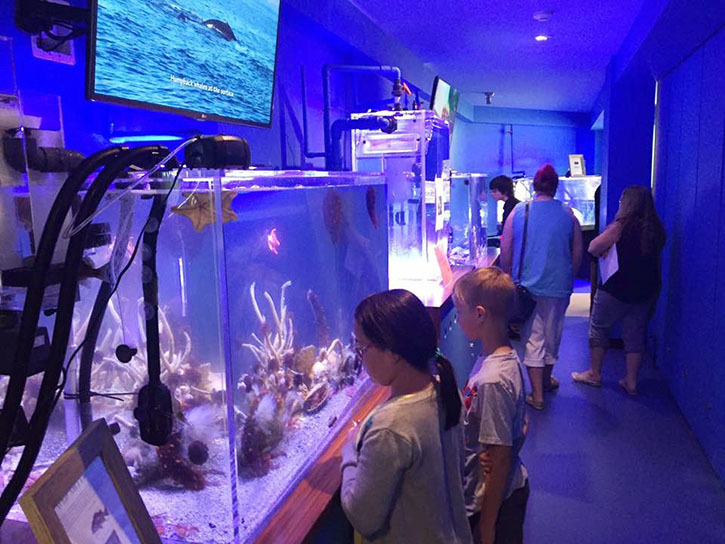 The West Coast Aquatic Aquarium and Stewardship Centre at Harbour Quay is open at last, after years of planning and months of renovations. It hasn’t been an easy ride, according to WCA stewardship executive director Sheena Falconer. “We’ve had a lot of challenges. Taking the aquarium from design concept and turning into a reality has been a long journey with many ups and downs,” said Falconer. There’s a lot to share inside the aquarium at the former Clock Tower Gallery space. The interior is painted bright ocean blue and lime green and full of every underwater creature you could hope to see in Barkley Sound, along with a tree carved from a 400-year-old cedar tree that comes from Uchucklesaht territory. The log was donated by Western Forest products. “Our exhibits are divided into ecosystems. “We have a freshwater ecosystem exhibit that has chinook and coho salmon fry in it,” said Falconer. The releasing is key to the aquarium and stewardship centre’s main message of stewardship and conservation, rather than just marine creatures on display. ““Everything is catch and release here. We want people to understand that we’re not just randomly taking these animals out of their environment for entertainment, we’re doing it because we think it’s important to deliver a message about these animals’ homes,” said Falconer. Looking to replicate the environment that exists in the Alberni Valley, the aquarium will also have estuary and intertidal exhibits. “It’s to get people to understand the importance of our local wetlands,” said Falconer. Visitors will also get to see something a little below the surface. Through a partnership with NEPTUNE, the Ocean Networks Canada site on Mallory Drive, the aquarium will have access to underwater footage from the sound too. Falconer hopes that having the centre right in the middle of Port Alberni will help residents and tourists alike get to know their local waters. “One of the reasons for creating this centre is that we were fundraising so that we could send kids places where they could look at ocean creatures,” said Falconer. Having sent many classes off to Bamfield and Ucluelet, the organization wondered if there was a better way. The soft opening on May 1 was a great success, according Falconer. “It was fantastic. It was really busy,” she said. With the success of the soft opening, the aquarium will be open from 10 a.m. to 5 p.m. seven days a week. To keep up with any changes and new programs that will be starting soon, follow West Coast Aquatic on Facebook.